Determining which style of home theater furniture to buy depends on a number of factors, including personal taste and budget. Obviously, you want to buy stuff that you'll enjoy looking at and using, but that doesn't cause undue financial strain. But perhaps the most important factor to consider when selecting theater seats is your existing décor. Just like regular sofas, armchairs, and recliners, home theater furniture comes in a variety of styles and designs. This is good news for you because it means you can choose a style that fits right in with your current decorating scheme so you won't have to completely overhaul your media room. Purchasing theater seats that match your other furnishings or room accents (such as carpeting, area rugs, and window dressings) also results in a more polished look and cohesive ambience, which should certainly be one of your goals. To help you decide on a good look for your media room, here's a quick rundown of the different styles we carry at TheaterSeatStore.com, as well as some tips on who should purchase the products. The products in these categories are designed in a timeless fashion that never goes out of style. These theater seats and sectionals tend to be bigger and slightly bulkier than modern creations, and feature lots of soft, round curves. They're often finished in deep, rich leather or darker earthy tones to match the wood furnishings that usually accompany them. If your viewing room is spacious and has dark wood tables or shelves, then you'll probably want to stick with our Traditional or Classic offerings. Our Modern and Contemporary theater seats boast intriguing designs that mark them as products of the current era. They tend to have sharper lines and angles than the classic style, and are often more compact as well. These products are available in a wide variety of colors and fabrics, making them compatible with many decorating schemes. If you have a lot of glass or lacquer accents in your viewing room, then check out our Modern and Contemporary selections. These two styles are at opposite ends of the spectrum, and have to do more with available space than décor. Space saver or wall hugger theater seats are units that can be set up with minimal wall clearance to help maximize the limited floor space in smaller rooms. Oversized models, on the other hand, are unapologetically large and are obviously meant to be used in much bigger areas. Microfiber is a very durable synthetic fabric that is used for many applications, including upholstery. Because it lasts longer than other types of fabric and is highly stain-resistant, this is an excellent choice for your home theater furniture if you have small children and/or pets. Many of our products are available with the latest microfiber technology, so be sure to shop this category if you expect your home theater furniture to be subjected to a lot of wear and tear. 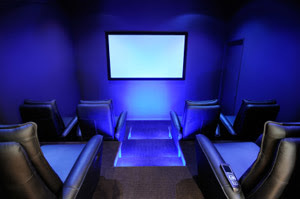 When it comes to home theater furniture, TheaterSeatStore.com has numerous styles and designs to choose from. Our large inventory makes it easy for you to find theater seats that fit your décor, tastes, and usage needs, so visit our site today!